Laizer and Moshe, a winning team, along with Esther, Baruch and Jonathan. Arriving home after 6 weeks on the road is not easy. I wake up in the morning and wonder what hotel I am here, which country and what on earth I am supposed to do today, and where is the bathroom located? I forget where I put things 6 weeks ago when I left home. I am totally disoriented. Part of the cost of the seminar tours is the blurry period when I arrive home. But this is the reality of life. So I needed to make a copy of our DVD "Gun Defense Volume One" for a student who realizes that it is essential to own this DVD. But when I tried to burn the DVD it did not work. For some reason the program was not working. Darn computer system! So I called my computer expert staff. Laizer calmly explained to me that, if I recall, Baruch changed the format. We have upgraded the quality of our DVD production and as such we are using a different format these days. My mistake was in using the new format to burn a DVD which required the old format. Not being a computer guy this is a natural mistake. Now Laizer is very kind with me. He knows this is not my expertise so he always explains computer matters to me in "human terms" rather than in computer terms. When he speaks with Baruch, although it is English, they sound like two crazy guys from Mars. Gigabites and megatights, I have no idea what they are talking about. I am not stupid but when it comes to computer I need things explained in a simple and easy to follow way. I do not mind being treated like a child. I prefer the approach from the movie "Airplane" when the guy says to his staff, "Explain it to me like I am a 10 year old". Although these days the average 10 year old is already a computer geek and knows far more than I do. So for me it is more like, explain it to me like I am person from the previous generation. (which I am). So Laizer suggested that we can arrange it so that I can burn all the DVDs in the exact same format so as not to get confused and to have to remember which DVDs require which burning process; i.e. arrange it as such that I can burn ALL the DVDs the same way. Makes perfect sense. In fact that is what we do with IKI Krav Maga. We create a single thread that runs through all of our techniques, a uniformity of techniques that unites all our techniques in a simple way. Instructors are able to remember that if the knife or gun is at this particular angle we use technique A but from a slightly different angle we use technique B. But this will not work for most students. This will not work for students whose Krav Maga ability is comparable to my computer ability. We need one technique for all the different situations. Just as I need something simple for my computer work I understand that most people need simple techniques and concepts for their Krav Maga training. If they are going to be able to use Krav Maga techniques in a real life situation they are going to need something simple and easy to follow. That is what IKI Krav Maga is all about. 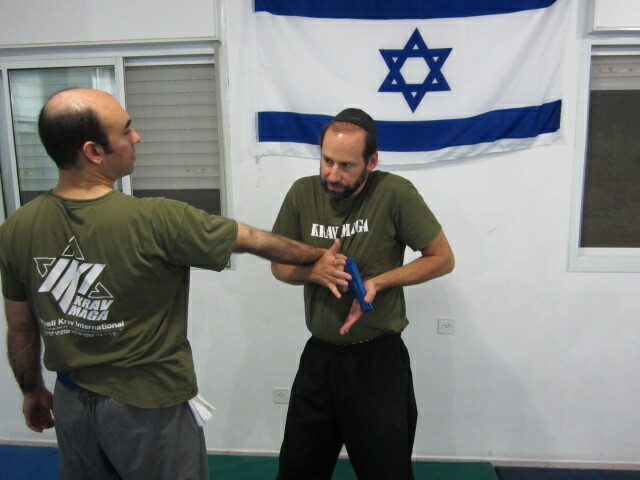 Purchase authentic up to date Krav Maga training DVDs directly from Israel. Step by step, easy to follow, in English.